ISBN: 9780071763035 ISBN10: 0071763031. Written by: Jean Yates. s/c, 224 pp.. Each chapter of this comprehensive workbook focuses on a theme, such as family or travel, so you can build your language skills in a systematic manner. With more than 250 exercises, concise grammatical explanations, a new chapter on contemporary vocabulary and an answer key to rate your comprehension, you are well on your way to perfect your new vocabulary. ISBN: 9780738611006 ISBN10: 073861100X. This easy-to-use handbook is perfect for anyone who is just learning the English language. ESL Beginner introduces you to the basics of English grammar with confidence-building activities and exercises that move you to the next level with the right tools and at the right pace. ISBN: 9780738611280 ISBN10: 073861128X. REA's ESL Beginner uses daily living skills to help students understand basic English grammar concepts such as nouns, verbs, simple sentences, compound sentences, and modifiers. After a concept is introduced, examples are given to show the student how to use the concept in a sentence. Concepts are reinforced through individual work, class discussions, and group projects. English words that may be unfamiliar to the student are defined. ISBN: 9780071741316 ISBN10: 0071741313. Written by: R Spears. Softcover, 193 pp.. This handy resource is organized by theme so you can find what you are looking for quickly. Includes a rich variety of phrases for hundreds of everyday situations. ISBN: 9780071496421 ISBN10: 0071496424. Written by: M Lester. Softcover, 304 pp. 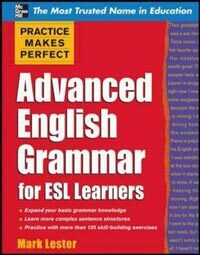 This reference book explains the complex grammar mysteries so your intermediate and advanced ESL students can improve their English language skills. The explanations are in depth and clear, and hundreds of sample sentences are included to clarify the concepts. Here is an innovative method to help your students conquer tough subjects such as articles, tense, verb complements, word order, and more. ISBN: 9781438000022 ISBN10: 1438000022. This book was written especially for middle school and high school students growing up in families where English is not the first language. Includes all parts of speech, with advice to improve vocabulary, spelling and pronunciation. In the final three chapters you will concentrate on written English, advancing from correct punctuation and sentence structure to writing essays and stories.